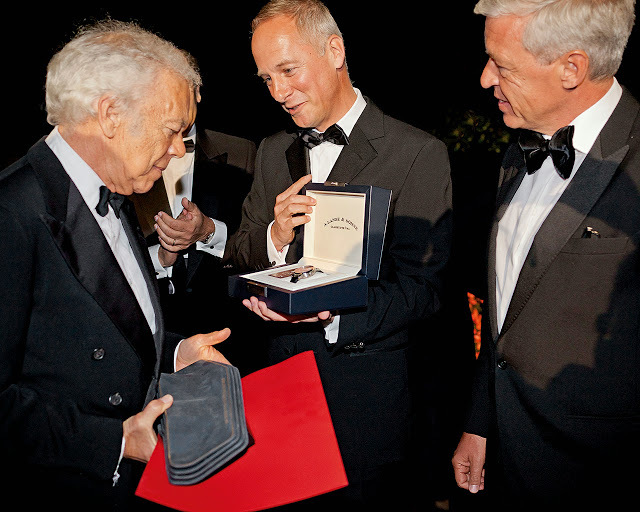 With his Bugatti 57 SC Atlantic winning the “Best of Show” prize at the Concorso d’Eleganza Villa d’Este 2013, Ralph Lauren took home a unique Lange 1 Time Zone. 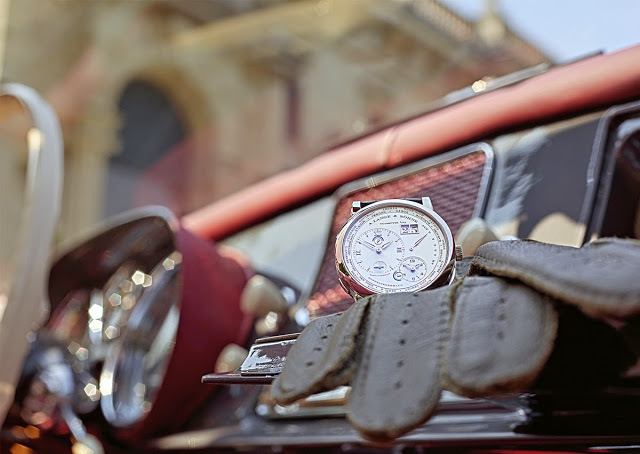 For the second year running, Lange is a partner of the Concorso d’Eleganza Villa d’Este, a prestigious annual competition for classic cars held at Lake Como. 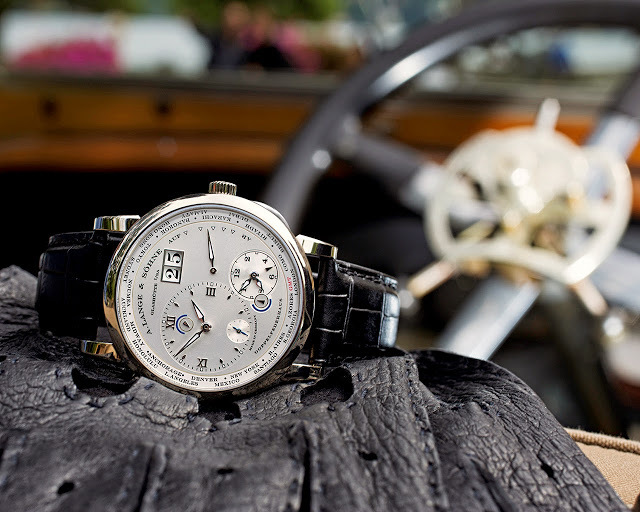 As with last year, Lange contributed a unique Lange 1 Time Zone in white gold to be given to the winner of the “Best of Show” prize. 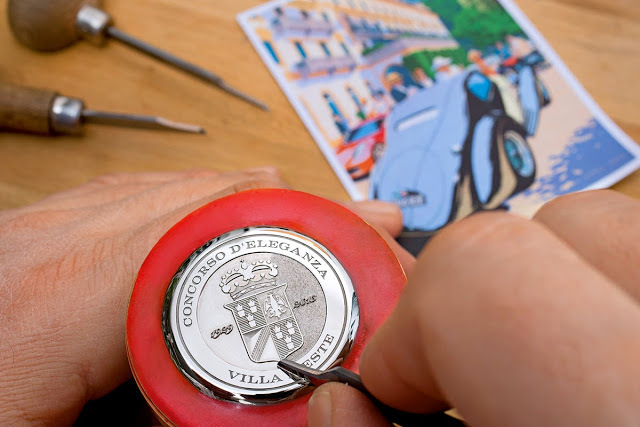 The watch has a specially engraved case back in relief, along with “Como” on the cities ring of the time zone mechanism. 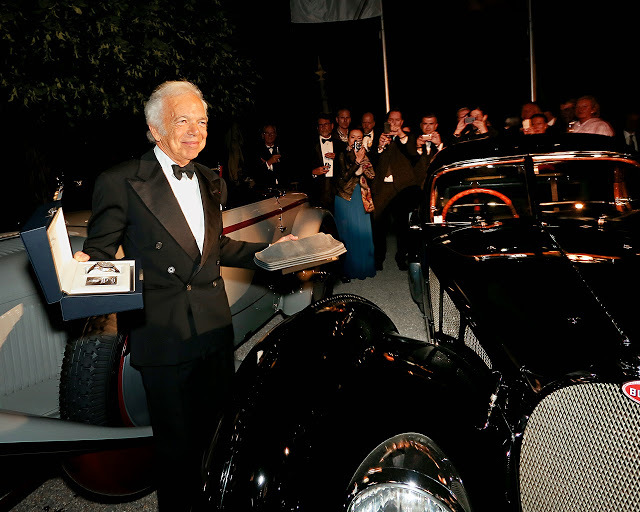 This year Ralph Lauren’s 1938 Bugatti 57 SC Atlantic Coupe took the prize, and he received the special Lange watch from CEO Wilhelm Schmid. 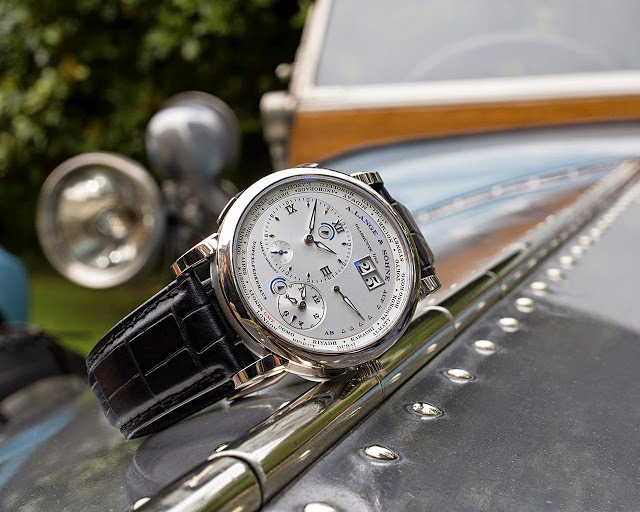 Mr Lauren is a renowned collector of classic automobiles, and also a Panerai collector of sorts; at one time several of his ads featured models wearing various Panerai watches. 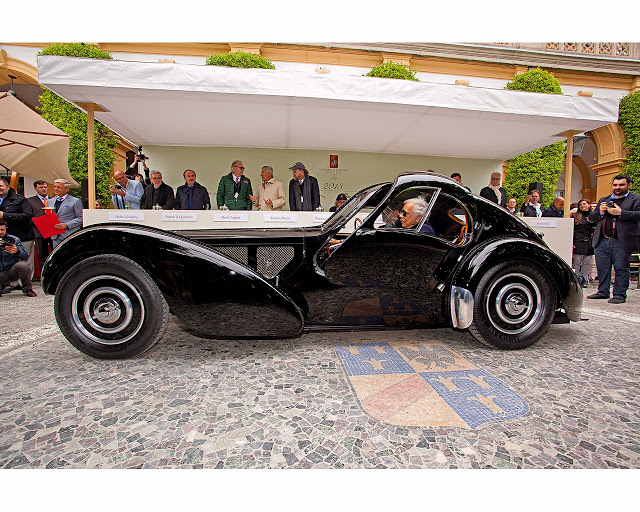 The Concorso d’Eleganza Villa d’Este is organised by BMW, and Mr Schmid was with BMW just before joining Lange. 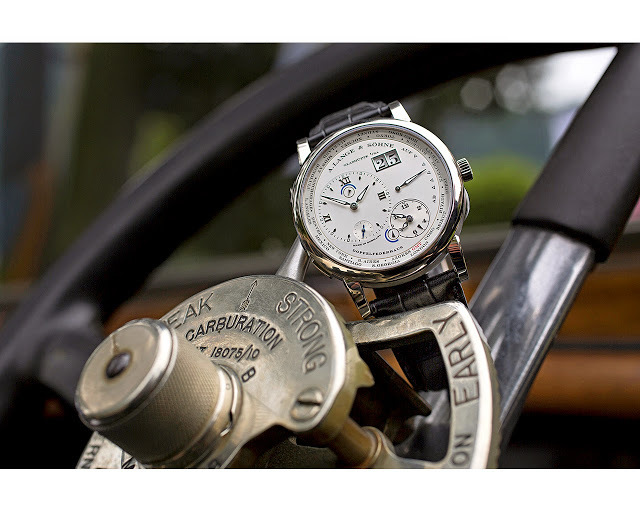 Enjoy the beautifully taken photos of the unique Lange 1 Time Zone set on a 1913 Rolls-Royce Silver Ghost Austrian Alpine Trials Car. 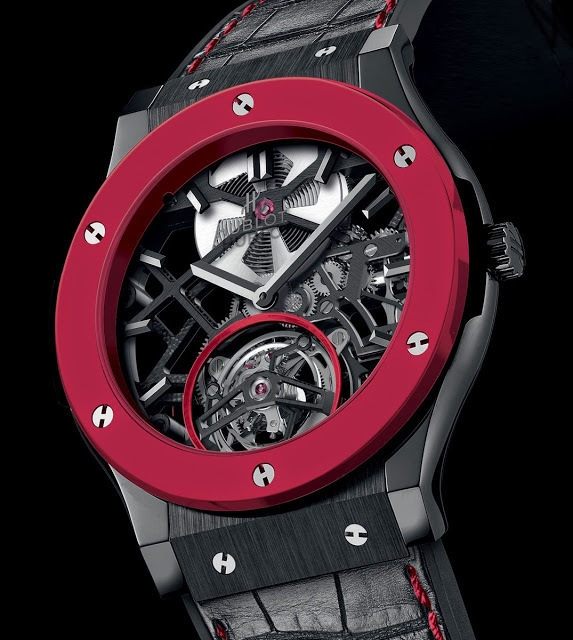 A unique piece created for Only Watch 2013, the Hublot Red’n’Black Skeleton Tourbillon is the first wristwatch to have a red ceramic component, in this case the bezel. The bright red ceramic bezel of the Red’n’Black Skeleton Tourbillon has the same property as its common black or white cousins, namely scratch resistance. 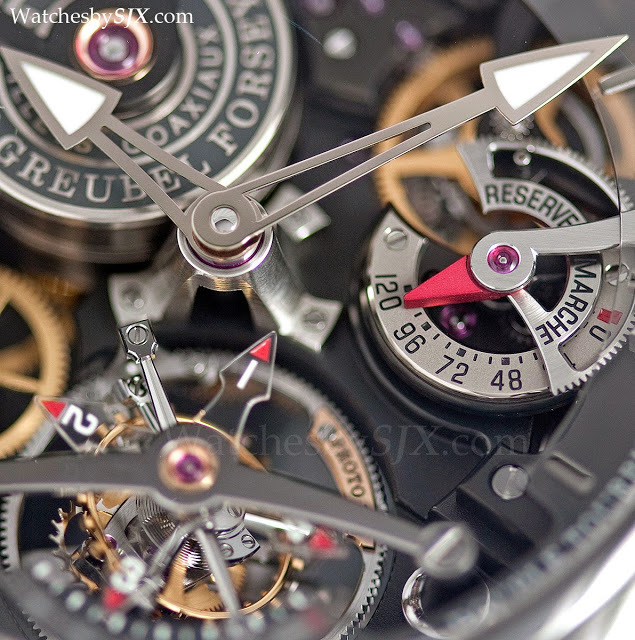 Red is a thematic colour for Only Watch – the Patek Philippe ref. 5004T is similarly coloured – being the state colour of the Monegasque flag. 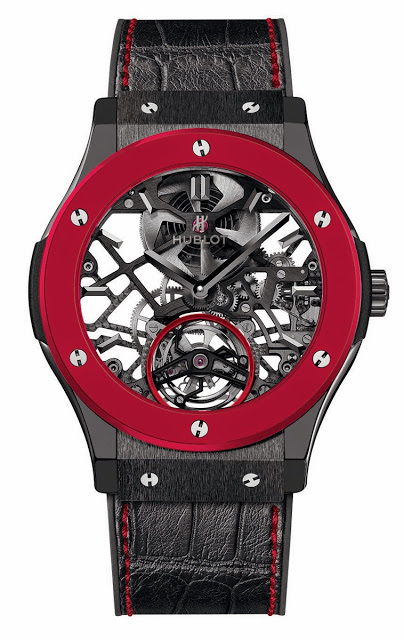 Bezel aside, the rest of the watch is mostly a standard Hublot Skeleton Tourbillon. The 45 mm case is in black ceramic, while the movement is an in-house open-worked tourbillon calibre with five day power reserve. Two addition details reflect the red theme: around the aperture for the tourbillon is a red anodised aluminium ring, echoing the red bezel. And most obviously the strap has red stitching. This Hublot, along with the rest of the Only Watch 2013 timepieces, will be sold on 28 September 2013 in Monaco, with all proceeds going to the Monegasque Association against Muscular Dystrophy. 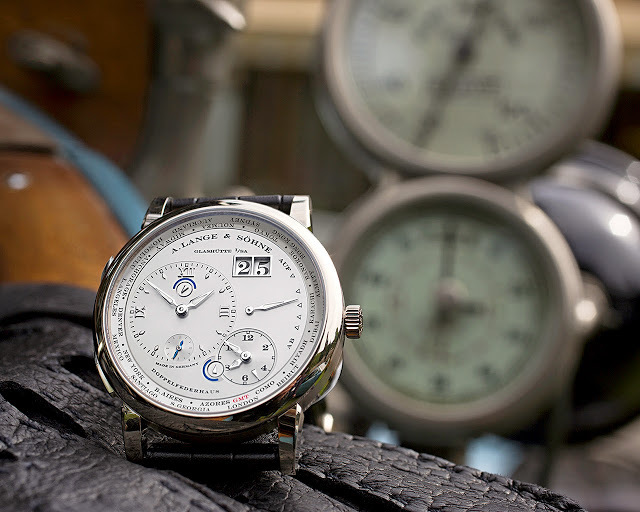 Details of the sale can be found on the Only Watch site. 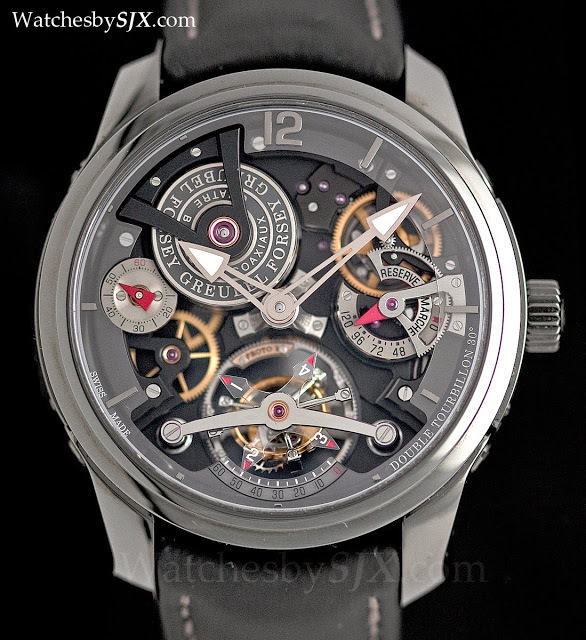 Earlier this year Greubel Forsey unveiled its first ever titanium watch, the Double Tourbillon Technique DLC treated titanium case. 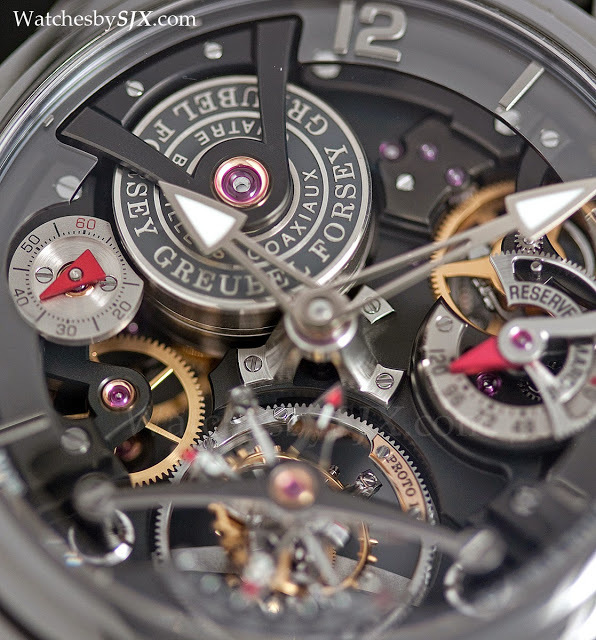 Greubel Forsey specialises in exotic and expensive tourbillons, all of which are available only in precious metals, until now. The new Double Tourbillon Technique has a glossy, black DLC coated titanium case, matched with a stitched rubber strap. 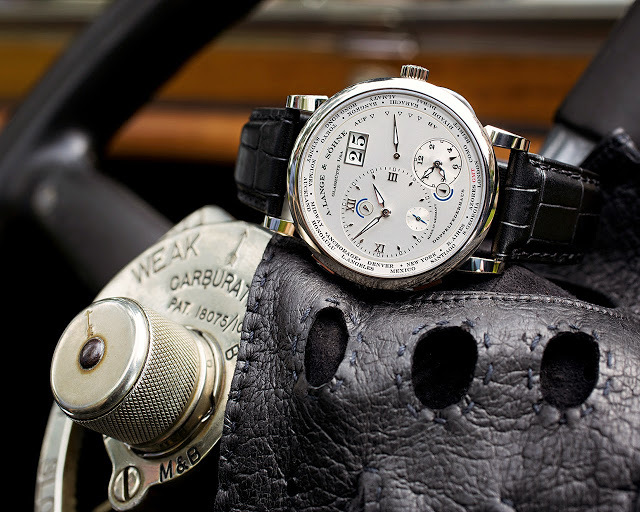 It is a striking departure from the typical Greubel Forsey style. 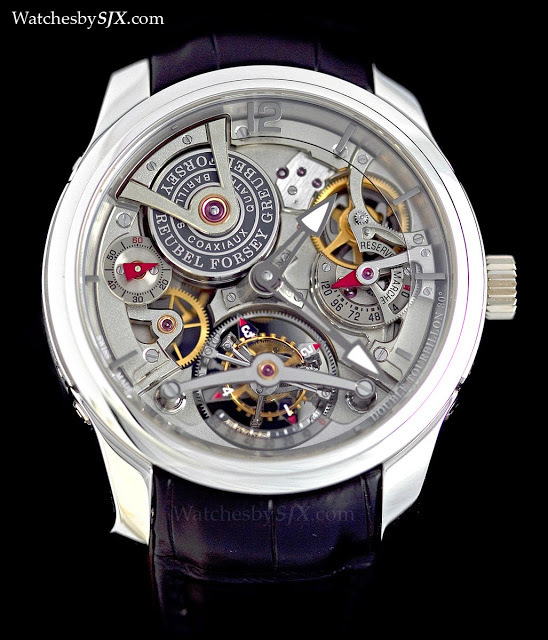 Ironically, though this is Greubel Forsey’s most fashion forward watch, the Double Tourbillon 30° was actually the brand’s first tourbillon, featuring two carriages: the inner cage inclined at 30° with a one minute rotation, and the outer cage rotating once every four minutes on the same place as the dial. 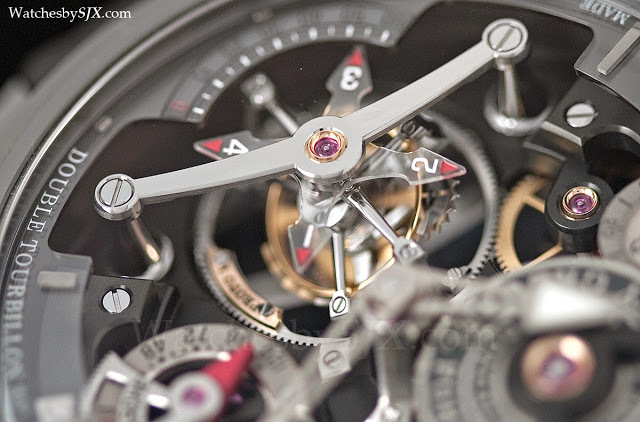 Several versions of the Double Tourbillon 30° have been created, including the most recent Double Tourbillon Asymétrique, but the Double Tourbillon Technique series is the only one with an open dial, revealing the lavish decoration and construction of the movement. 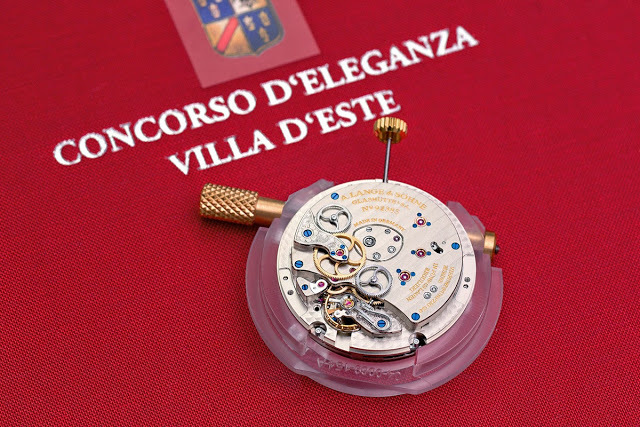 Remember that it is this same movement that won the Concours de Chronométrie 2011. Unfortunately, the black aesthetic of the watch means that the details of the finishing is not as apparent as with the other models, especially on the black coated bridges and plates; it’s there but just not too visible. That is a shame. 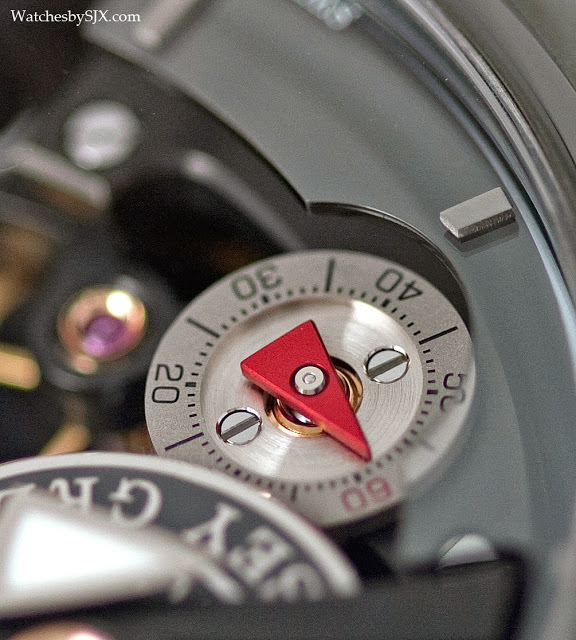 The case has a 47.5 mm diameter, but unlike the precious metal versions, the Double Tourbillon Technique in titanium is lightweight and sits far better on the wrist. 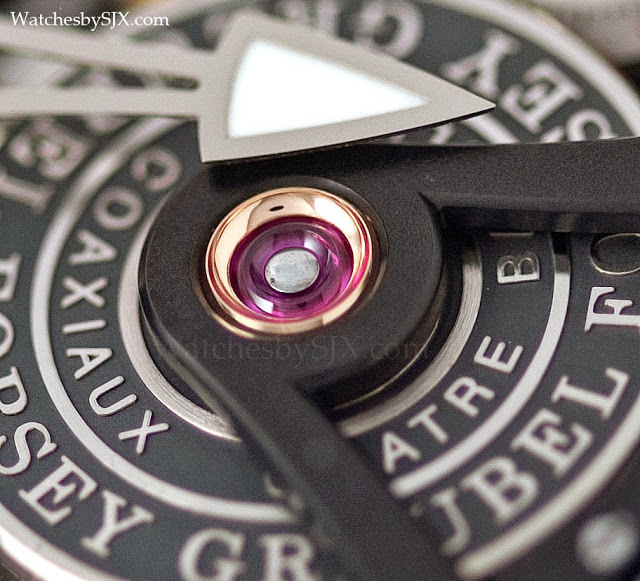 I am not usually a fan of finely finished complications in sporty, black-coated cases. 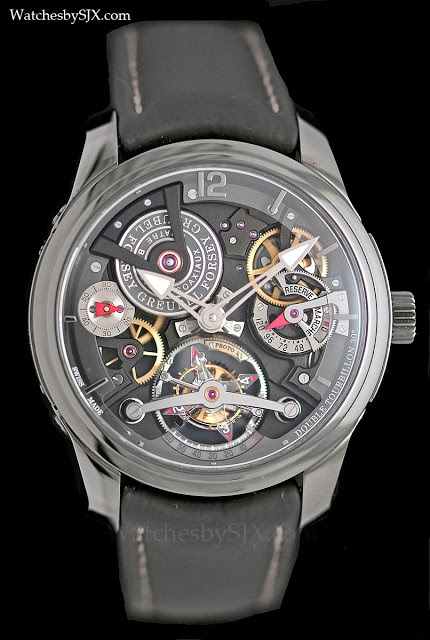 Every single Greubel Forsey watch is a magnificent example of accomplished watchmaking, this included, but I find the look incongruous with the movement and function. 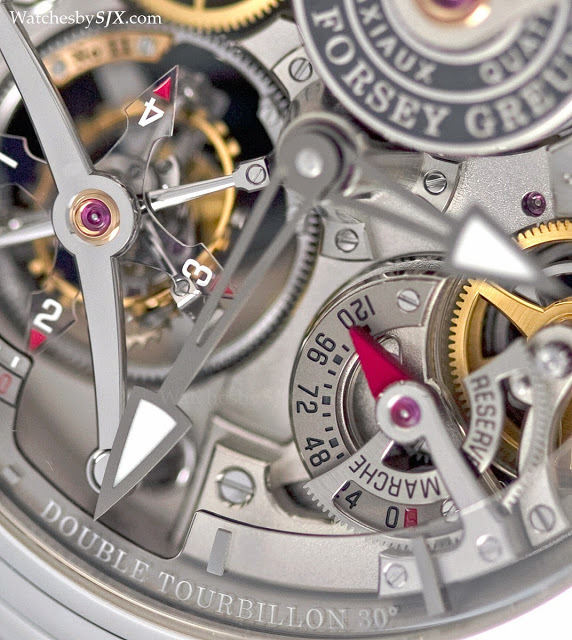 For comparison here is the Double Tourbillon Technique in platinum. This is akin to a matte black Rolls Royce Phantom with racing stripes – but then again there are enough people around the world driving cars just like that. 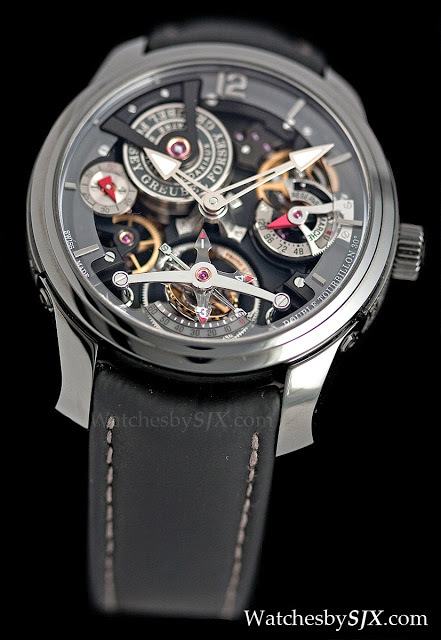 The Double Tourbillon Technique retails for S$786,450 including 7% tax in Singapore, or about US$620,000.